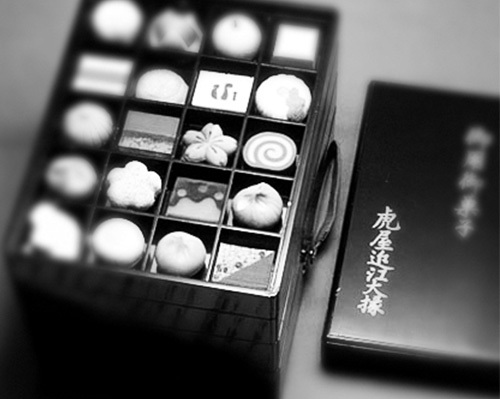 Toraya although most of the Toraya’s confections are made by modern processes and with advanced technology, the traditional wagashi-making methods have been preserved for Wagashi so that each of these cakes is designed as an original work.  Toraya's current president Mitsuhiro Kurokawa is the 17th proprietor following the foundation of the company by Ench? Kurokawa in the 1600's. It has over 80 shops located mainly in Tokyo and Kyoto and a shop&tea room in Paris. Enchu Kurokawa is considered as the founding father of the present-day Toraya. By the 1600's, he created in Kyoto a confectionery business which appears in the records of the company as a purveyor to the Imperial Court in Kyoto during the reign of Emperor Goyosei (1586-1611). 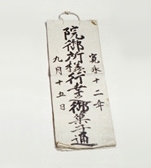 Record of confectionery served at the Imperial Palace on September 15, 1635, to honor Empress Meisho's visit to the former Emperor Gomizuno-o. Toraya's 5th proprietor, Mitsutomi, was granted the honorary title of Omï Daijo in recognition of his many years of faithful service to the Imperial Household. The oldest illustrated reference book, which would be the equivalent of a product catalog today, was completed. In order to overcome the economic crisis, the 9th proprietor Mitsutoshi compiled a set of rules for shop employees aimed at reforming the shop. The standards he spelled out are still largely applicable today. 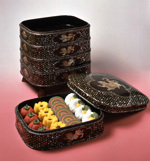 The nation's capital moved from Kyoto to Tokyo with the Imperial Household and Toraya opened a shop in Tokyo, too. 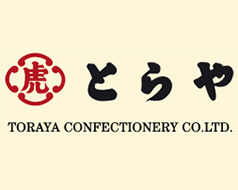 Toraya was reorganized as a joint-stock company, and a year later it was renamed as Toraya Confectionery Co. Ltd. Opening of the first outlet at the Tobu Department Store in Ikebukuro. 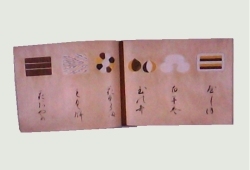 Creation of the Toraya Archives (Toraya Bunko) which gather catalogues, ancient records, documents, literature and a wide assortment of materials related to wagashi. Opening of a shop&tea room in Paris. Launching of the new brand TORAYA CAFÉ, based on an original concept of pastry that crosses the traditional boundaries between wagashi and western pastries such as the combination of red bean paste and chocolate. 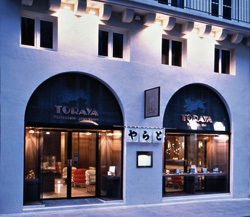 Opening of the Toraya shop in Tokyo Midtown.